Here is a demo of the new 3D Model TURNTABLE animation created by Christie on the TLC Creative design team. The Turntable animation adds a 3D rotation, of a 3D model, that can be once, twice or endless as an on-slide emphasis animation. For this demo the Microsoft logo 3D model logo was sourced from Remix 3D. There are only 2 slides in the demo presentation, each for a specific task. Slide 1 has the TURNTABLE 3D model only animation applied, with a rotation RIGHT and set to continue until end of slide. 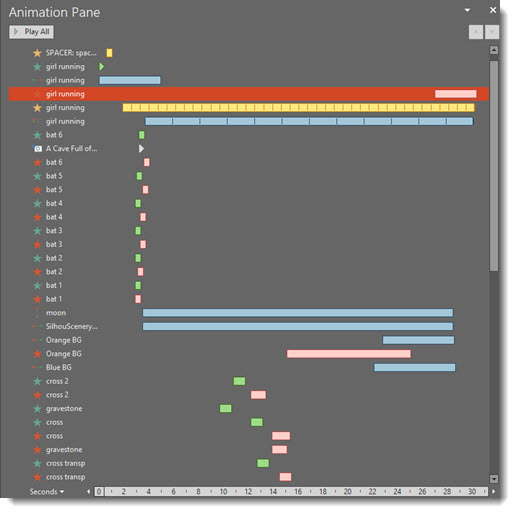 Each 3D Model animation has a number of options. As example, changing the DIRECTION from the original RIGHT to DOWN. 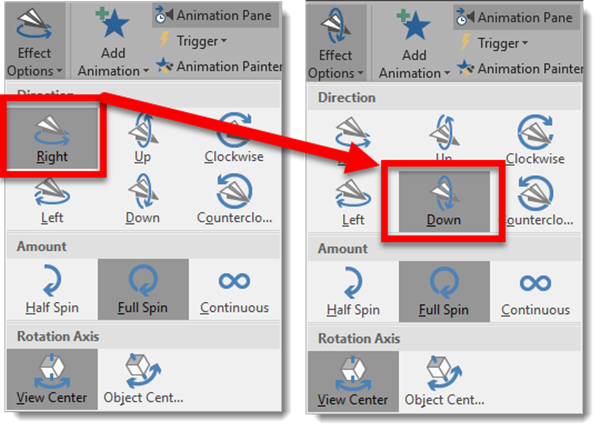 To change the effects of the animations, select the 3D model, click the Effects Options drop down, and the menu shows all available variations for direction, type of rotation and where the rotation axis is. Slide 2 is how this could be used in a real-world presentation. With slide 1 the logo has a never-ending rotation continue while the presenter introduces the topic. 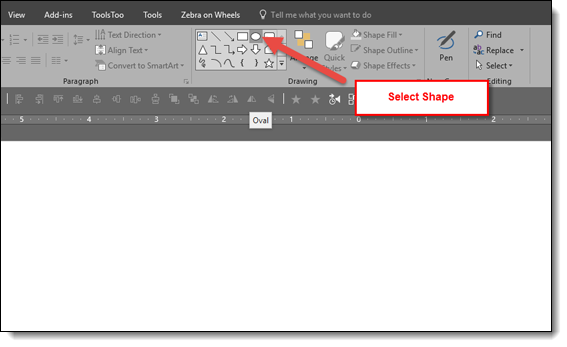 Then with a click to advance to slide 2, a morph transition to seamlessly moves and shrinks the logo to the right side of the screen while presentation content (the bullet list text) enters. And then for fun we used another new 3D model only animation, Jump & Turn, on the Microsoft logo in its new position. Just experimenting with 3D models and how they can be animated in PowerPoint is exciting and fun for me, because it is new options, new rules, and new visuals. For fun I wanted to create a 3D Virtual Fly Through style animation. Things did not work how I originally intended (we are definitely limited when it comes to moving the camera view inside a 3D model in PowerPoint vs. other 3D specific software). 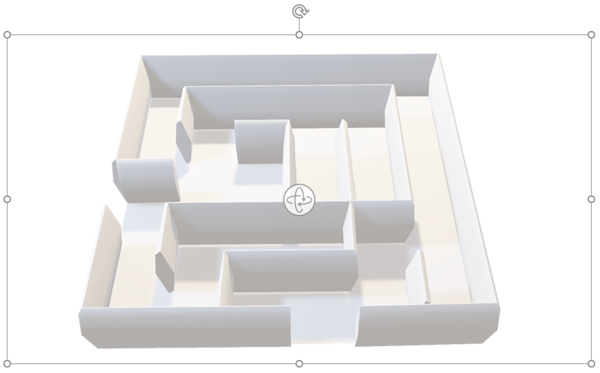 Here is the 3D model of a maze sourced from Remix 3D. The final presentation is 21 slides, all motion (except the first and last slides) accomplished with repositioning the 3D model, using the 3D View ball, 3D Pan & Zoom and Morph transition. The final result is a simpler, but still amazing (pun intended!) motion graphic. Amber on the TLC Creative design team created this fun presentation example that uses 3D Models as art elements on almost every slide, and makes use of the new on-slide 3D Model animations. The presentation is 16×9, PowerPoint 2016 Office 365 with 3D Model support. Slide 5: lots of 3D model animation, just because we can now! 3D models are not always small file sizes. This presentation has not video, but it is 60 MB! The editable PowerPoint file can be downloaded here. Just having some holiday fun here at TLC Creative. 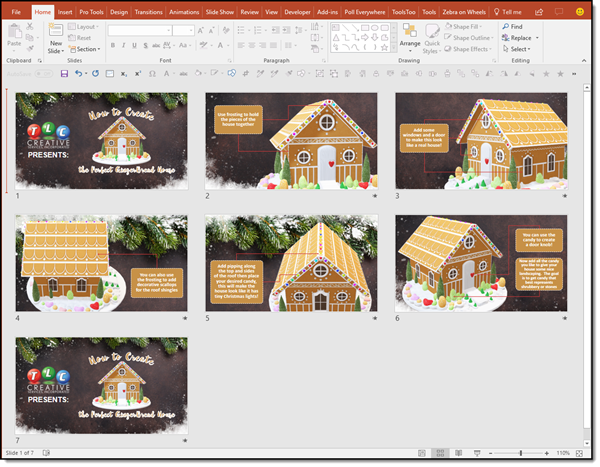 Christie, on the TLC Creative design team, created this fun Christmas Animation using 3D (the Gingerbread house), holiday background image and PowerPoint text & graphics. Using only Morph transitions for the motion, this animation was accomplished in just 7 slides. 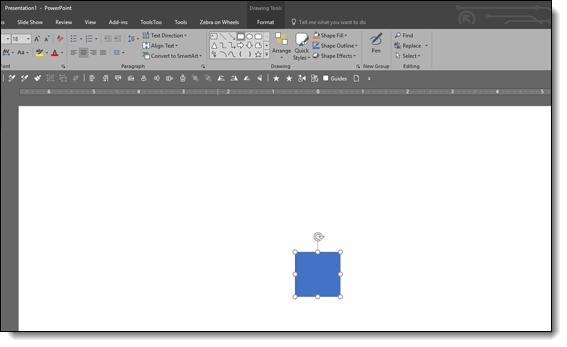 Throughout January, The PowerPoint Blog is showcasing all 3D model use in PowerPoint. TLC Christmas PowerPoint Animation 2017! Our team here at TLC Creative Services hopes everyone has a fantastic Christmas! As with years past, our design team has had some fun with PowerPoint animation for Christmas! 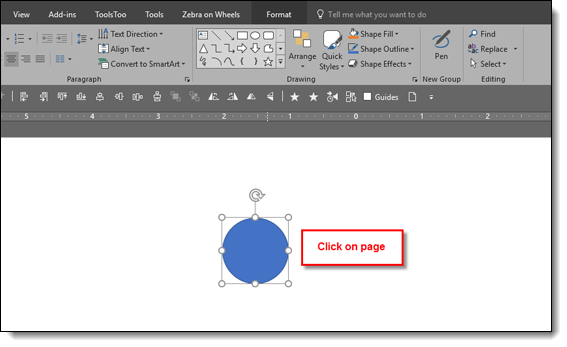 Want A Perfect PowerPoint Circle, Square, Triangle? Click on the slide. Note: just a simple click, no click and drag, no modifier keys, nothing, just click on the slide. And the shortcut to the shortcut! Perfect symmetrical shape is automatically added to the slide! 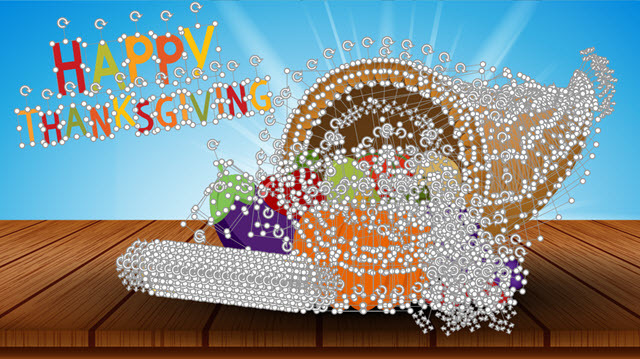 PowerPoint Illustration – Thanksgiving Cornucopia! Amber, on the TLC Creative design team, loves Adobe Illustrator and PowerPoint. We challenged her to build a full vector illustration in PowerPoint. The result is an amazing Thanksgiving cornucopia! Wanda on the TLC Creative design team created this amazing PowerPoint Halloween Movie. Just like a movie plot, it has 3 scenes. Each is a slide, and each seamlessly transitions from one to another (watch the video, there is no clear distinction of when the action transitions from one slide to another!). If you are at the office, caution – fun Halloween themed soundtrack accompanies the animation fun! In the most recent episode of The Presentation Podcast, episode 40 “Mistakes We Have Made,” we talk about presentation design and business mistakes we have made along the way. On LinkedIn, I have a new article that gets more PowerPoint specific, “PowerPoint Mistakes We All Make.” Part 1 of a 3 part series details 15 behind-the-scenes PowerPoint application setup customizations for a faster and more efficient work environment. PowerPoint’s Morph (transition/animation effect) and Zoom (new custom shows) have had an amazing adoption rate and become something we use in projects on a regular basis. The addition of support for both effects on mobile versions of PowerPoint has happened fairly recently. Amber on the TLC Creative Presentation Design Team created a fun, small file size, sample presentation setup with Morph transitions and Zoom custom shows for us to test and see how they work on our mobile devices. After downloading, it is important to open with Microsoft PowerPoint on the device, not a PowerPoint viewer application. For iPhones (IOS), this means click-and-hold the file name to bring up a list of applications it can be opened with. 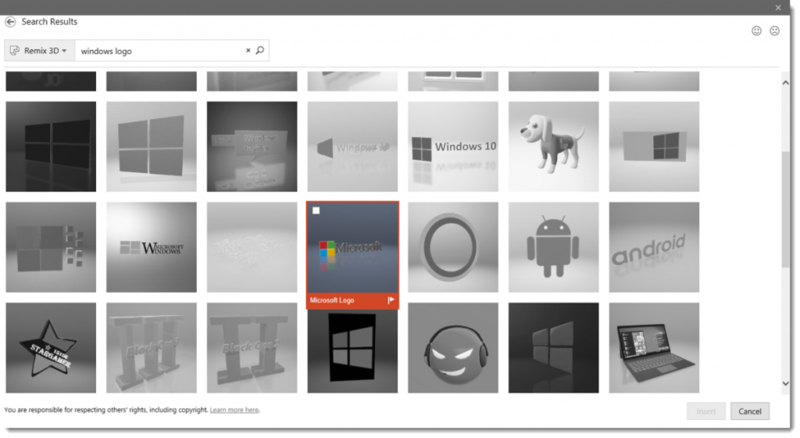 Select the Microsoft PowerPoint icon. 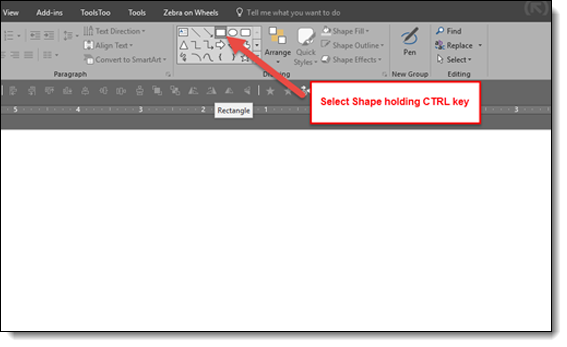 Download > click-and-hold to select “Copy to PowerPoint” > the mobile version of PowerPoint opens > Presentation opens > click the Play icon to view as a slide show. Here is a quick video capture showing the visual effects that should be seen on the mobile PowerPoint apps.